I have had the awesome chance to work with a great company called The Pink Monogram. You may be wondering, what is this site you talk about? Well, The Pink Monogram is known for their Monogramed Clogs! Monica was very nice and fun to work with. In 2007, she was nominated for Business Person of the Year by Greenville Magazine. In 2008, She made the "O" list on Oprah.com . The Pink Monogram again made Oprah's favorite in 2010 when their High Heel Monogrammed Clogs appeared in the July 2010 Magazine. The Pink Monogram has over 4000+ monogrammed and engraved gifts available! They have iPhone cases, jewelry and more! You name it, they have it! I had the wonderful chance to review the Monogrammed Pink and Green Throw. This throw is so adorable. The Pink and Green Throw is 50x60 with green whip stitch trim. I was able to choose my thread color, then select my font or monogram style. 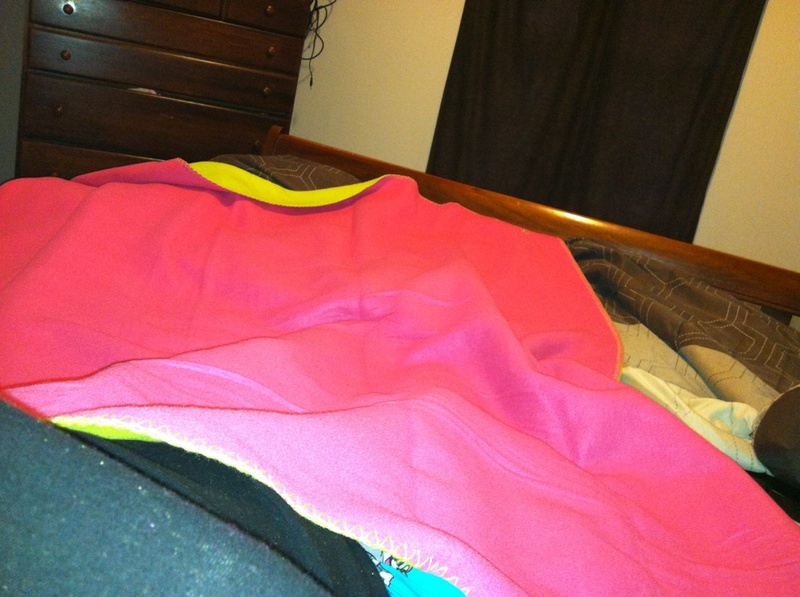 I am completely satisfied with how big it is and how warm it keeps me. I definitely have my new cuddle blanket. I am sitting here on my couch, all warm and cozy with this blanket while writing this review. You can see in the picture above how big this blanket is. It covers most of my queen sized bed! Overall, Monica was so nice and her company has so many great products I recommend it to ALL of you! You can buy this Throw for $35. Check out The Pink Monogram and see what other products that they have. Christmas will be here before too long, maybe you will find that special gift for someone! You can also find them on Facebook and Twitter. Let her know that Bre from The Small Things sent you too. If you could have anything from The Pink Monogram, what would it be? Tell me, I would love to hear! 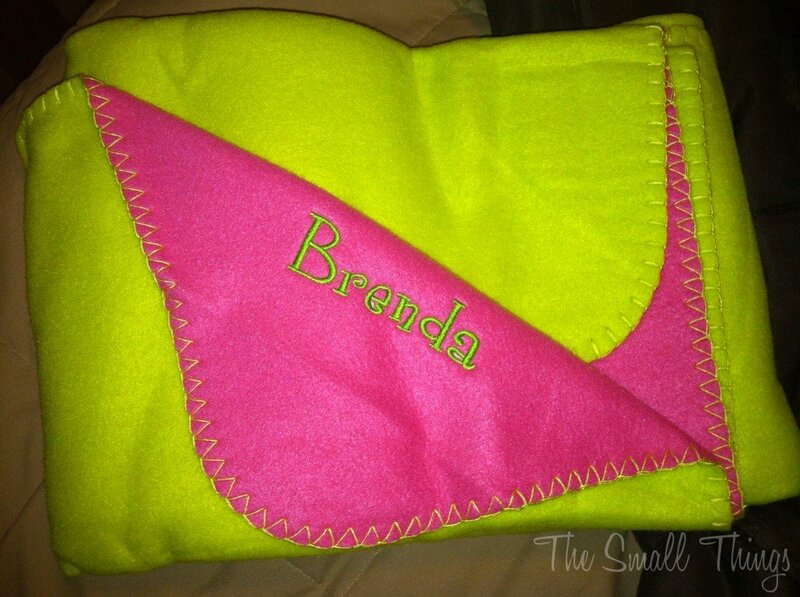 One lucky reader will get to win this a customized Pink and Green Throw. Open to the US only. Winner must enter on the Rafflecopter below. Failure to complete the mandatory entries will result in all entries being invalid. Winner will have 48 hours to respond to winning email. If you do not respond I will be forced to choose another winner. Goodluck! Giveaway ends on 9/7/12. The Small Things is not responsible for prize shipment. Wow! Hard to choose a favorite! Her site looks amazing!! so many fun things to check out!! I love the totes and weekender bags! I'd love the hard case for the iPad, but can I have an iPad with it? I love the Personalized Photo Vase. It would be cute at my wedding next year. I would love to get a messenger bag. I hear so much about this company - they look great! Plus, having such a great selection is always a bonus. Great review and the throw is adorable! Love those clogs! I'd probably go with a bag. The mini caddy is perfect! It would be hard to choose there is a lot of really cute things!! Love the phone and iPad cases! So cute! I love the pink and green blanket! Either the Monogrammed Cutting Boards or the Monogrammed Kimono Robe. I honestly couldn't decide. I love the monogrammed wool clogs! I'd love to have a few of the Monogrammed Market Totes in different colors.My fave is the light blue. Thanks for the cool giveaway! How to choose?! The cutting board would be such a cool gift...very different... and the necklaces for myself...lol.. I would love the monogrammed cutting board! What a great idea! I love the totes and the throw you showed. WOW! There's a ton of stuff to not only choose from but to also be able to customize and personalize much of it is awesome! !